Why you should choose our chunky cosmetic glitters ? Compare to other chunky glitter set, our cosmetic glitters is bigger contain with totally 120g of 12 different vibrant and glimmering shining colors. Which means it will be more economical if you buy our festival glitters. Why don\'t you take our glamorous glitters to shine yourself like a star today? SAFE NON-TOXIC shiny sequins body art glitters made of high quality ingredients. No harmful to your body and no unpleasant chemical smell. Suitable for professional use or home daily use. Dry fast, long lasting fix glue, easy clean with soap water, makeup remover. Let\'s go make yourself a sparkling artist today! 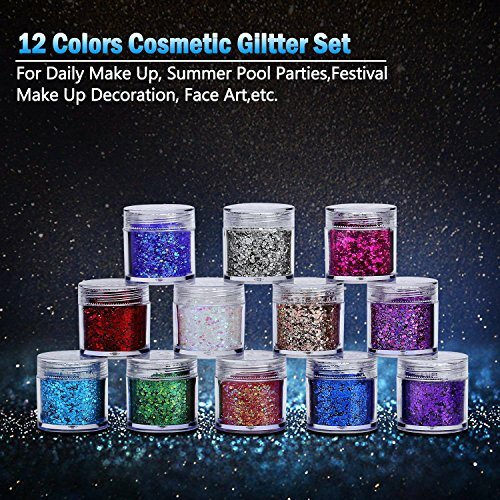 Multiful use arts and crafts glitter perfect for your body from head to toe: face, body, eyeshadow, lips, cheeks, makeup, nail art; perfect to decorate your home, cell phone\'s case, glasses; made a love card for your lover etc. Crazily! Amazing! Great use for arts and crafts, scrapbooks. Get these chunky art glitters to set your instagram facebook on fire with your shiny pictures! ✮ 100% MONEY BACK GUARANTEE & QUICK DELIVERY✮ If you don\'t absolutely love your order, simply return it, and we\'ll refund your order. CLICK the \"ADD TO CART\" button above to get the Face Glitter set now!